Unlike most people, I don’t hate Ron Howard’s 2001 live-action adaptation of “How the Grinch Stole Christmas.” Is it a great movie? No, of course not, but I do think it has some positive qualities. The visuals are stunning, I like many of the supporting performances (particularly Jeffrey Tambor as the Mayor of Whoville), and some of the ways in which they flesh out the story to fit a feature length film are creative and effective. Everything else? Not so much. The film isn’t so much a heartfelt adaptation as a shameless, go-for-broke parody, as evidenced by Jim Carrey’s wildly over-the-top performance. It has an identity problem, warm and serious one moment and overtly comedic the next, and Howard never manages to smooth out the jarring tonal shifts. 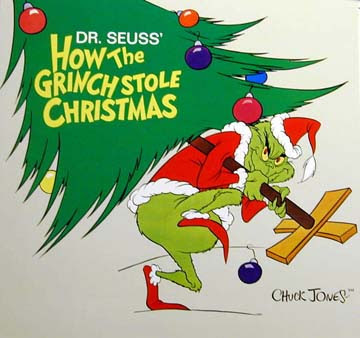 As such, the message and simple power of the story are diluted, leaving us with a “Grinch” that is a hollow shell of the original Seuss classic. The 1966 animated TV special, on the other hand, is perfect. Absolutely, 100 percent perfect. It has endured for 45 years now because Chuck Jones and company recognized that the strength of Seuss’ story didn’t come from the fantastical setting or moments of humor; it is a simple, yet powerful little story, and that power shines brightest when the story is stripped to its core. The TV special is, in essence, an animated, voiced production of the Seuss book, no more, no less, and that’s exactly what it needs to be. It is quaint, straightforward, and more enjoyable for it; Howard should have looked to this special when crafting his film, because watching what Jones pulled off here, it’s clear that “The Grinch” doesn’t need any extraneous frills to entertain. Choosing Boris Karloff to narrate the film and voice the Grinch may be the single greatest contributor to the special’s success. With his deep, melodious voice, Karloff is wonderful in both roles. As narrator, he takes the material completely seriously, even when Seuss’ rhymes are at their most ridiculous, lending the story a sense of gravity and authenticity it wouldn’t otherwise have. As the Grinch, he perfectly embodies this dastardly curmudgeon; unlike Carrey, he doesn’t play the character for laughs, but really makes us believe that this is a being with a rotted, despicable soul. Going that dark makes the character’s ultimate redemption all the more meaningful. The animation is a blend of the classic, wacky Dr. Seuss style and the iconic imagery of “Looney Tunes” god Chuck Jones. The result is a colorful, stylized look that emulates the feeling of Seuss’ images better than any other Seuss adaptation, be it TV, Film, Live-Action, CGI, etc. 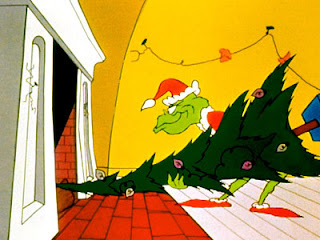 The Grinch himself is much more detailed then he is in the Seuss book, where he was a black-and-white figure who looked like any other generic Seuss character. The town of Whoville and its citizens, also animated in stripped-down black-and-white in the book, is greatly expanded upon, and though the special is short, it is a visual feast from start to finish. As I said above, the special is a mostly straightforward adaptation of the book – Karloff’s narration is stripped right from Seuss – but the big point where it embellishes is in the music, featuring some big song numbers that are really wonderful. 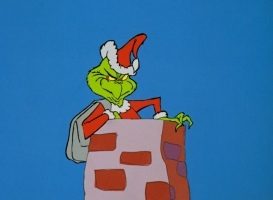 “Welcome Christmas,” with its Fa-Hoo-Fa-Hoo chorus, isn’t just a jubilant encapsulation of all things Seuss, it’s an iconic Christmas carol in its own right at this point, and the gloriously misanthropic “You’re A Mean One, Mr. Grinch” isn’t far behind. Like the word “Grinch,” these songs have entered the pop culture lexicon, and they aren’t leaving any time soon. The same can be said of the special as a whole, of course. 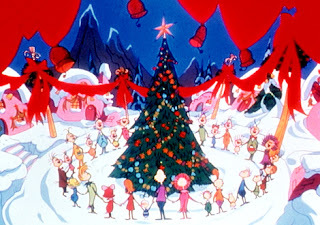 To this day, the longevity of the animated “Grinch” amazes me. It is a quaint yet endlessly entertaining little special that improves upon what Seuss wrote while sticking to basics, and doesn’t make a single misstep from beginning to end. Given the story’s popularity, I don’t think Howard’s live-action debacle will be the last new version we will see, but the original animated classic will always be the best.